Today the old Gray Lady, the New York Times, no less, weighed in on election hacking in an Op/Ed piece titled The Election Won't be Rigged. But it Could be Hacked. Of course, anyone who's read my second cybersecurity thriller, The Lafayette Campaign, a Tale of Election and Deceptions, already knew that. The particular focus of the NYT article is that since voting can be hacked, it's vital to have a way to audit elections after they occur to see whether that has been the case, and to reveal the true electoral result. The solution, according to the author, is to require that all voting machines work off of hand-marked paper ballots that can then be reviewed after the election to discover any fraud. Incredibly, not only do many voting machines now in use not use paper ballots, but they don’t preserve any sort of primary electronic record, either – just the final totals (authentic or hacked, as the case may be). If these machines were hacked, experts agree, there would be no way to recover the original votes, and perhaps no way even to confirm whether the machines had been hacked at all. Op/Eds have strict length limits, so the author didn’t have the opportunity to go even deeper. If you do, the situation becomes even more ludicrous. For example, some states that do use paper ballots require that any audit be performed by running the ballots back through the same machines – and then destroying them – within 24 for hours of the election. It’s hard to imagine a better way to configure a law to be sure that you could hack an election without being caught, or a legitimate reason for being so exclusive and expedient in your audit rule. It’s unclear what mechanism the Trump campaign envisions for this rigging. Voter fraud through impersonation or illegal voting is vanishingly rare in the United States, and rigging the election by tampering with voting machines would be nearly impossible. That’s a very odd statement to make, since it’s been shown over and over again how easy it would be to physically tamper with voting machines (here’s an example of how to do so in just seven minutes). Given that between elections voting machines are kept in storage rooms in public facilities like schools and courthouses, often unlocked and unsupervised, and the fact that polling stations are staffed by volunteers (who could themselves have incentives to hack the machines), it’s hard to believe the author holds that opinion. It is true that it would take far more work and opportunity to swing an election by physically hacking individual voting machines one at a time, and perhaps that’s what she intended to convey. So here we are, with experts concluding that the Russians have been tampering with the election, Op/Eds in the Washington Post and New York Times highlighting how easy it would be to steal the election, and municipalities across the country that are using outdated and vulnerable machines doing – exactly nothing about it. Meanwhile, in other news, I’ve had another 100 or so Russian followers sign up to my author's blog since my last post on the same topic. I’ve sent emails back to about 25 of them over the past 10 days asking how they discovered my books, and have gotten exactly 0 responses. 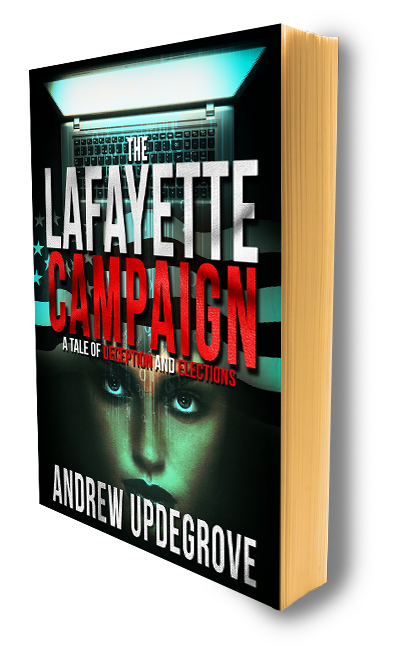 If you’d like to read what may be the script for the hacking of this year’s election, you can find it here: The Lafayette Campaign, a Tale of Elections and Deception.